Sept. 19, 2013, 2:50 p.m. Yesterday, The New York Times came out with another impressive digital narrative package for a sports story: Tomato Can Blues.. It combines lush illustrations and audio narration and reads like a graphic novel come to life. You might even say it’s sort of like…nah, let’s keep the “S” word out of it as long as we can. But for all its beauty and richness, just like its avalanche-themed forebear, Tomato Can Blues debuted with boring ads. Specifically, a couple of standard banner ads — which appeared last night to be coming from ad networks, no less — looking a little out of place in the otherwise carefully laid out piece. The same boring Google network ads that chase me around the web shouldn’t chase me through beautiful big-ticket multimedia NYT blowouts. Snow Fall (yeah, sorry) was dinged for the same problem — the ad-side creativity not matching the edit-side creativity. And if you look at the code for the ad units on Tomato Can Blues, the url in the iframe is http://www.nytimes.com/­packages/­html/­multimedia/­bundles/­projects/­2012/­AvalancheDeploy/­avalanche_ad_leaderboard.html — which, as you might gather from the address, is the exact same ad unit as in Snow Fall. “Snow Fall” carried standard ad units that were not custom built for the story, clunky additions to a slick feature. After its publication, the Times’ business side said it planned to work with advertisers on custom ads for these types of stories in the future. Ms. Quitasol said the Times approached several companies about advertising in “The Jockey.” BMW signed on and was kept in the dark about certain elements of the story: The company didn’t initially know when it would be published, what it would look like, or even exactly how the ads would render, according to Ms. Quitasol. “It’s brave and shows a trust for our brand,” said Ms. Quitasol. Oddly, some time between that email and this story’s posting, all the ads on Tomato Can Blues seem to have disappeared, at least on our computers. Ellis, Justin. "The New York Times’ “Tomato Can Blues”: Lovely editorial design, kinda boring ads." Nieman Journalism Lab. Nieman Foundation for Journalism at Harvard, 19 Sep. 2013. Web. 19 Apr. 2019. Ellis, Justin. 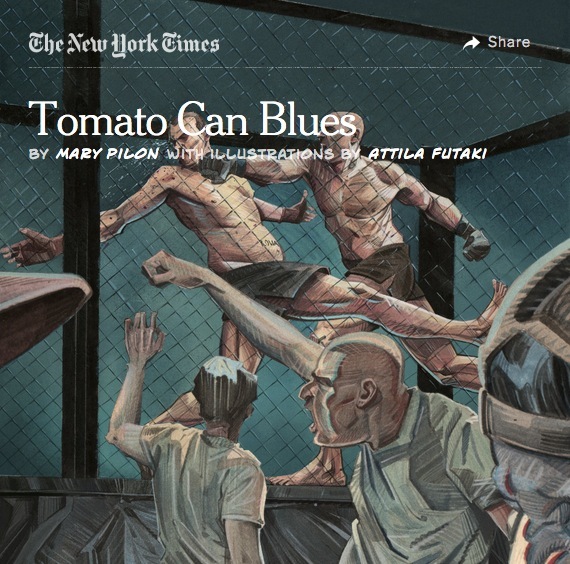 "The New York Times’ “Tomato Can Blues”: Lovely editorial design, kinda boring ads." Nieman Journalism Lab. Last modified September 19, 2013. Accessed April 19, 2019. https://www.niemanlab.org/2013/09/the-new-york-times-tomato-can-blues-lovely-editorial-design-kinda-boring-ads/.